Our sixty something male had noticed a swelling confined to the tip of his nose for well over a decade. Interestingly enough, he knew only by sight that another man in his town had the same problem. 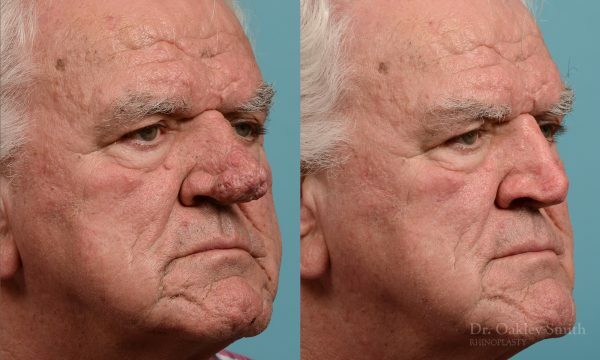 Shortly before consulting Dr Oakley Smith, he bumped into him at their local supermarket and was surprised to see he no longer had the nasal growth. He introduced himself and asked what had happened. Our patient had been using a number of lotions without any effect. His new acquaintance told him he needed surgery and to go and see a surgeon called Dr Oakley Smith! The skin condition our patient had is called rhinophyma. 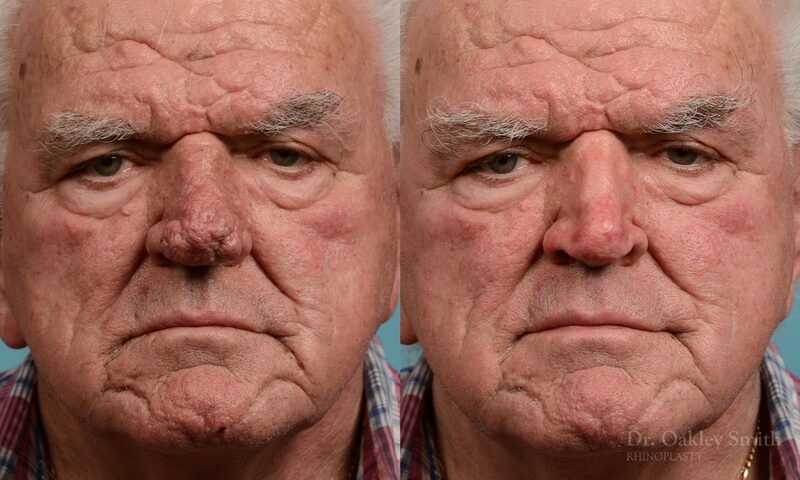 It is also known as ‘rum or whiskey nose’, however there is no evidence whatsoever that alcohol has any effect on rhinophyma. 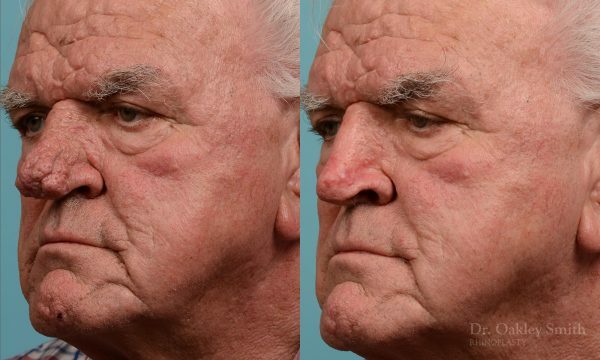 The condition arises from a skin rash called rosacea. The small oil glands of the skin are stimulated to undergo explosive growth by a common and ever present skin fungus which most people have. The condition usually takes years to develop and this is the reason why the majority of people are middle aged or older. It is an uncommon problem. 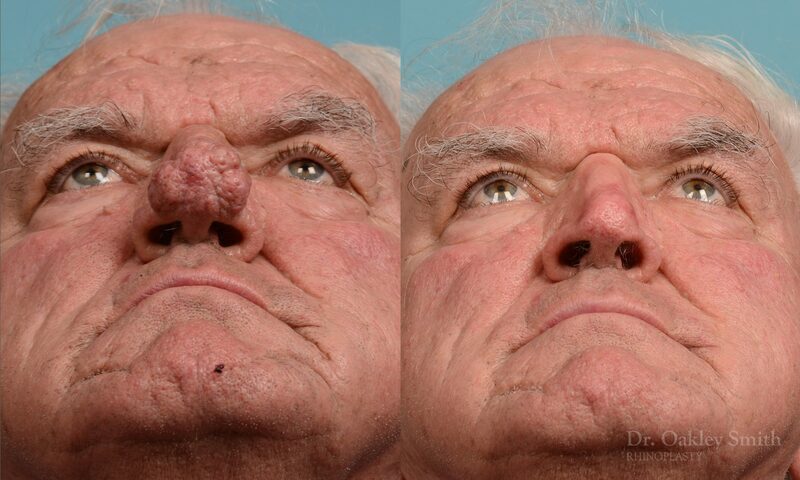 At surgery the excess skin is shaved off until the underlying nasal framework of cartilage is reached. Great care is required not to remove too much skin as this then results in scaring. 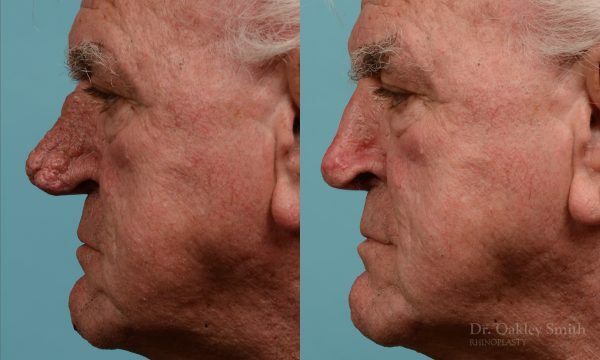 There is a ‘sweet spot’ where enough skin remains to allow resurfacing of the skin, but not too much is left behind as this means the improvement is compromised. The recovery is surprisingly painless. 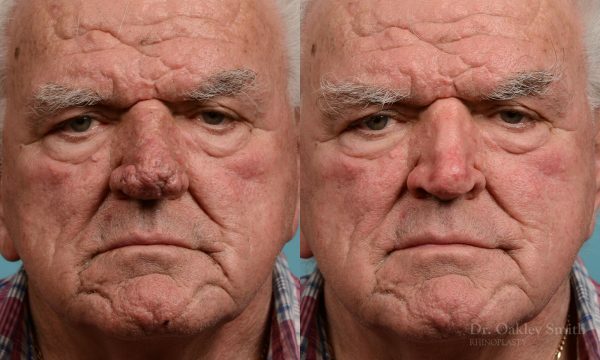 The nose heals, but regrowth of the remaining skin spreads over the raw surface of the nose. Just like a scraped knee scab of youth, the process is crusty and messy and takes two weeks to complete. 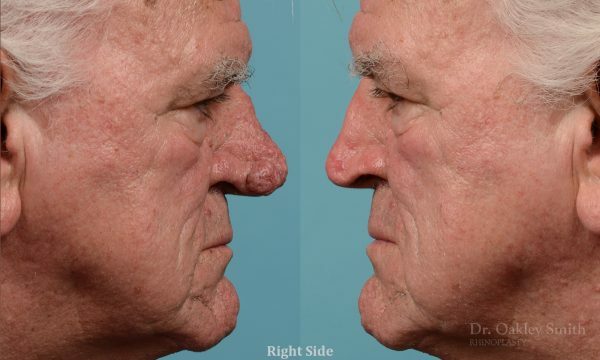 Before and after photos by Dr Oakley Smith, a recognized expert in rhinoplasty and rhinophyma surgery in Toronto.